Terry and Diane Ellah launched Country Affair Candles, Inc. in 1995 out of a large shed on their rural property in Meaford, Ontario. As the business grew, so did their space, but they eventually moved to the current location of “the Candle Factory” in 2001. Here’s how it all began. Since 1995, Country Affair Custom Candles has been shipping Meaford, Ontario handcrafted candles to customers far and wide in Canada and the U.S.
Terry Ellah used to sell at craft shows across Ontario, offering a variety of products, including candles from Country Home Candles. But because he didn’t have a permanent retail outlet, Country Home Candles stopped selling to him. He decided to learn how to make candles himself. He found a mentor in Peter Parker, a master chandler living in Thornbury, and under Peter’s tutelage, he learned the secrets of creating beautiful, long-lasting, scented candles. The Candle Factory’s signature bumpy texture style continues to be one of its most popular lines. Terry and his wife, Diane, began making hand-poured scented candles at home, and they developed a signature style with a bumpy texture. 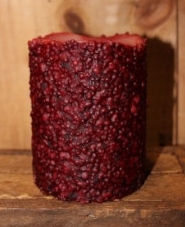 The concept came out of the U.S., but the Ellahs “Canadianized” the technique, making candles that had a “country candle” feel, but were a little more refined and less primitive than their American counterparts. It quickly became one of Country Affair Custom Candles’ biggest lines. Country Affair thrived, wholesaling to retailers across North America. After they made three expansions to the shed to accommodate the operation and its 10 employees, they moved to Meaford’s old “Wheelbarrow Factory”, a poured-concrete building built in the late 1880s for the Meaford Wheelbarrow Company. Along with more space for the candle factory, they now had room for a factory retail outlet, and they opened their doors to customers. The retail shop quickly grew to three rooms totalling 3,000 square feet – and folks in town began calling the store “the Candle Factory”. The name caught on quick. In the years since, the retail end, which offers furniture, decorations and other rustic items along with candles, has grown to become a significant amount of Country Affairs Custom Candles’ business. Country Affair continues to make all their candles by hand. Skilled candle-makers melt the wax, add dyes and fragrances, and then hand-pour them into vessels or molds. The art comes in knowing the properties of different waxes and different dyes and how they react to heat, to create the perfect blend that will look beautiful, smell delightful and burn for a long, long time.